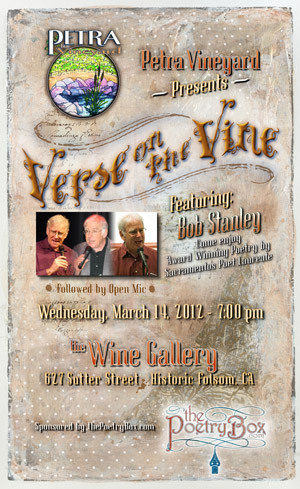 We’re proud to announce that our featured poet for March is Bob Stanley, Poet Laureate of Sacramento. Bob Stanley hosts readings at the Sacramento Poetry Center, at Sacramento public libraries, and many venues in the Capital area. His poetry has won numerous awards, including the California Focus on Writers prize in 2006. Bob edited the anthology Sometimes in the Open, and published a chapbook, Walt Whitman Orders a Cheeseburger, in 2009. He was named Sacramento Poet Laureate from 2009 to 2012. His second chapbook, Eleven Blue Strings, will be published in 2012.